How Much Is a Penny Worth? Not Enough to Keep Carrying It. How much is a penny actually worth? One cent, right? Wrong! A penny actually costs between 1.2 and 1.4 cents for the United States Mint, the division of the U.S. Treasury Department that makes all U.S. coins, to produce each one depending on the cost of metal. The total cost covers the pennies’ metal, fabrication, labor to make, and transportation to ship them around the country to the twelve separate Federal Reserve Districts and eventually our pockets. Last year, the U.S. Mint put 7.4 billion new pennies into circulation which weighed over 38 million pounds. Pennies are so heavy and cost so much to ship, that Army & Air Force Exchange Services (AAFES), the Army and Air Force’s version of Wal-Mart on bases in America and aboard, refuses to use them overseas. 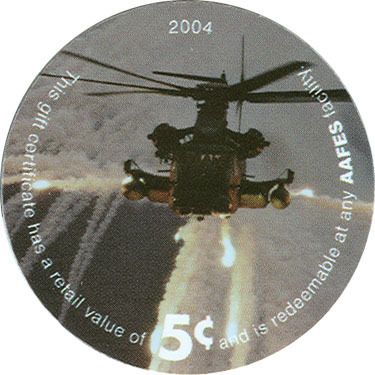 In Iraq and Afghanistan, AAFES does not use any coins at all. Instead they use pogs made of lightweight cardboard like the playing chips from the popular game of the 1990’s. In Europe, AAFES goes as far as to round all purchases to the nearest nickel in order to avoid using the penny. If pennies are so worthless, then why don’t we just get rid of them all together? Why not make a $19.99 DVD a nice even $19.95 across America instead? And, who are we really fooling with that extra 5 cents. I learned when I was five years-old that that was just a fancy way of writing $20. Would our psyches really deter us from purchasing DVDs if they where $20 instead of just under that price? The sad part is that politics plays a huge role in the decision to keep the penny around. Many lawmakers in Washington have tossed around the idea of eliminating the penny for years much to the displeasure of the Illinois delegation, Abe Lincoln’s home state. There aren’t enough reminders of Lincoln’s wonderful accomplishments already? 31 cities and towns across America are named after him. Six mountains in the United States are named after the President as well as a naval aircraft carrier and a submarine. He has a prominent memorial in the nation’s capital. He is still on the $5 bill. President Lincoln wasn’t even originally from Illinois. He just moved there later in life. He was actually born in Kentucky. The zinc producers of America have also lobbied Congress against dropping the penny out of circulation. The penny has been composed of 97.5% zinc and 2.5% copper since 1982. The U.S. government would save $103 million per year by not producing the penny. Millions of pennies are also thrown away every month. There are precedents when it comes to eliminating unneeded currency. The United States scrapped the half-cent piece in 1857 because of high manufacturing costs and unpopularity for the coin. Finland has stopped producing their version of the 1 cent and 2 cent euro coins, and the Netherlands and Belgium are both considering a similar initiative. According to Coinstar, the company who operates those horribly expensive coin-counting kiosks in grocery stores (up to 10% fees…just roll them yourself), estimates that approximately $10.5 billion, or $93.75 per household worth of pennies are sitting idle in piggybanks across the country. I have to be honest. Growing up I used to be one of those people who actually just threw pennies in the trash. I still can’t stand carrying the coins. But, now I put all of my pocket change at the end of the day in a jar on my dresser and save them for my children. Every couple of months, I roll that change and usually have a few hundred dollars to deposit in a bank account for them. It’s a great way to save when you think that you cannot squeeze another cent out of your budget. What about you? What do you do with your pennies? Should we scrap them all together? Next post: Roth IRA vs. Thrift Savings Plan (TSP) 401k – Which Is Better?